WatchCo.com is the premier online destination for supreme quality brand name watches at fantastic low prices. They carry some of the finest brand names in the industry featuring Casio, Citizen, Diesel, Fossil, Nike, Oakley, Phillipe Starck, Tommy Bahama and many more of the world's leading brands. WatchCo.com carries thousands of styles for all your needs and requirements featuring diamond watches, gold watches, metal band watches, leather band watches, two tone watches, silver watches, sport watches, men and women watches and more. You can easily find the perfect watch, from diamond to diving, they've got exactly what you’re looking for in a high quality, well-designed timepiece. 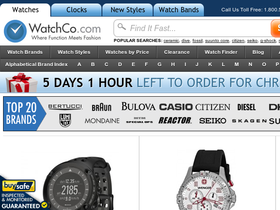 Shop today for your favorite brand at the best online prices, only on WatchCo.com. Visit 58Coupons.com to learn about the latest coupons, promotions and savings. Use this promo code from WatchCo.com to get $20 off when you spend $299 or more. Click link to shop. WatchCo.com offers Free Shipping on any order, any day of the week, including Hawaii, Alaska, APOs and military bases. Cool! Click link to start shopping. When you spend $300 or more at WatchCo.com you can save $15 simply by entering this coupon code. Click link to shop. Spend $150 or more at WatchCo and get $10 off your order when you use this code. Click link and save. At WatchCo.com you can get $5 off your order of $55 or more with this promo code.